The World Health Organisation(WHO) has urged each nation in the South-East Asia region to make food safety a priority. It stated that over 700,000 children die in the South-East Asia region every year due to diarrhoea and several other diseases caused by the impure food and water. "Bacteria, viruses, parasites, chemicals, and other contaminants in our food can cause over 200 diseases ranging from diarrhoea to cancer. New and emerging threats such as climate change and its impact on food production; emerging biological and environmental contamination -- all Apose challenges to the safety of our food," said Poonam Khetrapal Singh, regional director, WHO South-East Asia in a statement. These existing and emerging threats call for urgent action. Countries must put in place comprehensive food safety policies matched by legislation and robust food safety strategies, and they must be stringently implemented across the food chain. This requires a trained workforce and an informed and empowered consumer" she added. 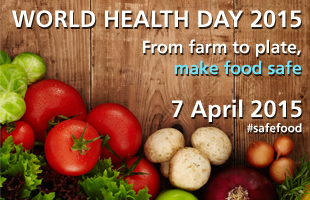 Food safety has been set as the theme for the upcoming World Health Day. Antimicrobial resistance is a growing global health concern. Overuse and misuse of antibiotics in animal husbandry, in addition to human clinical uses, is one of the factors leading to the emergence and spread of antimicrobial resistance. Antimicrobial-resistant bacteria in animals may be transmitted to humans via food. Food safety is a shared responsibility between governments, industry, producers, academia, and consumers. Everyone has a role to play. Achieving food safety is a multi-sectoral effort requiring expertise from a range of different disciplines – toxicology, microbiology, parasitology, nutrition, health economics, and human and veterinary medicine. Local communities, women’s groups and school education also play an important role. You can keep food safe in your kitchen by applying the five keys to food safety: keep kitchen, utensils, hands clean while cooking, separate raw from cooked food, cook food thoroughly, keep food at safe temperatures, use safe raw materials. 10. Consumers arm yourself with information on how to keep your food safe!